Dual-process theories posit two distinct types of cognitive processing: Type 1, which does not use working memory making it fast and automatic, and Type 2, which does use working memory making it slow and effortful. 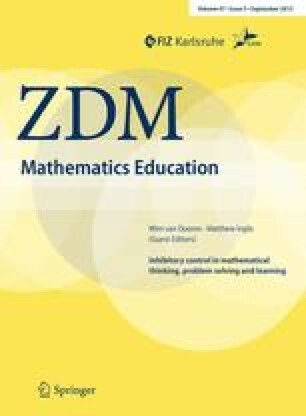 Mathematics often relies on the inhibition of pervasive Type 1 processing to apply new skills or knowledge that require Type 2 processing. In two studies, we demonstrate that giving participants a difficult task (Raven’s Matrices) before a task that requires the inhibition of intuitive responses (the Cognitive Reflection Test) significantly improves performance. Our findings suggest that encountering a difficult task that requires Type 2 processing before completing a task that requires inhibition of Type 1 processing may encourage an enduring ‘Type 2’ mindset, whereby participants are more likely to spontaneously use Type 2 processing for a period of time. Implications for mathematics education are discussed. Pontin, J. (2007, March 25). Artificial intelligence: With help from the humans. The New York Times. http://www.nytimes.com/2007/03/25/business/yourmoney/25Stream.html. Accessed 10 April 2014.